5k run Archives - Physical Therapy Consultants, Inc. Put on your running shoes (or walking shoes) and get ready for the 5th Annual Chaos 5k Fun Walk/Run! Festivities will be held on Saturday October 13th, 2018 at 9am. We are super excited for this event that takes place in St. Francis, MN at the Rum River North County Park. Get a team together this year to take part in the Chaos! Now you might be asking yourself… Why is it called the “Chaos 5k”? The name Chaos was chosen by our team at Physical Therapy Consultants (PTC) because of the fun our team brings to our communities. Throughout the route, CHAOS ensues at the most unexpected areas making it a unique and enjoyable experience for families, and friends. Top that off with some Halloween costumes and you have the making of a morning filled with non-stop laughter, excitement and fun. The Chaos 5k Walk/Run is the perfect community event for people of all ages and physical abilities. The route follows the beautiful Rum River and is paved which allows you to bring strollers, wagon etc. We also have great activities for kids before and during the event as well as music and multiple chances to win prizes! Even more rewarding than the fun and prizes is the opportunity to pay it forward! Each year PTC chooses a MN local non-profit organization to donate all the proceeds to. The past 3 years, PTC has chosen to donate to a wonderful organization called Citizen’s Supporting Our Armed Forces (CSOAF). CSOAF is dedicated to providing support to our MN troops who have been deployed. CSOAF provides this support by shipping care packages filled with essential items that are needed by the troops while still providing them a little piece of home. We also hold a competition between our clinic locations to collect the most donation items. The clinic that is able to collect the most items by the date of the 5k wins a great prize! We love seeing all the support that comes from our patients and community members in gathering items for these men and women who are fighting for our country. If you haven’t signed up for the 5k yet, no worries! Early bird registration is open until September 1st! Prices are very affordable at only $17 per person! Also for the first time ever, we are offering HUGE discounts for any teams of 4 people or more. Any teams of 4 or more will be able to register at $12 per person until September 1st! BIG SAVINGS!! Register at chaos5k.eventbrite.com! Teams of 4 or more can email Jackie at jgiese@physicaltherapyptc.com to redeem the discount and get registered for this great event. We look forward to seeing you Saturday, October 13th, 2018. Are you interested in beginning a running program? Do you have goals related to running or improving your cardiovascular fitness? With the warmer weather finally here, now is a great time to accomplish those goals and get started! BUT… where do you start? With so much information at our fingertips, beginning a running program can be overwhelming. Today we share our Top 5 Running Apps to help you stay on track. Where are my beginners at? Before, we get in to talking about apps and what each has to offer, I want you to go back to our blog last week and review the 5 Useful Running Tips for Beginners . Ok, now that you were able to review those tips… Let’s talk more about some great resources that you can use when beginning a running program. purchase as well if you are looking for a little bit more. Whether you are a beginner or a seasoned runner, the Strava app is a fun and interactive app that is not only great for runner but also cyclists. Strava means “strive”, an encouraging title to say the least. This app prides itself on creating a community for it’s athletes where everyone can work together to meet their goals. This app has al the analytics you need to track your progress. The nice thing about this app is that it is a one stop shop for tracking other activity such as swimming, rock climbing, and even crossfit. This is one of my favorite free apps available. C25K is a progressive app that starts you with walk and run intervals until you build up to running a 5k. This is a great app for beginners or individuals ready to get back in to a running routine. This app give you a set weekly goal and training program of 3 times per week with rest days in between. Each routine is 30-40 minutes long which is more than doable for any lifestyle. Oh, and did I mention you can link your favorite music playlist to this app!! Do you have a bit of a competitive streak?? The RaceRunner app, might just be the right fit for you! This app is super fun in that it allows you to participate in virtual races with others. Get creative in making your own races or participate in other races around the world. If competing is your thing, give this app a try! 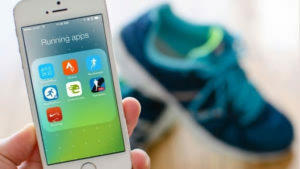 Runtastic made our list of the top free running apps because of the exercise diary. Like the other apps above, Runtastic uses GPS mapping to track your route in real-time and keeps all your metrics available so that you can see your progress. Another great feature of this app is its multiple training programs that you can follow for a more scheduled plan. There are so many available resources when it comes to fitness. Finding an app that is right for you, might take some trial and error. The bottom line is that you have resources to help you on your journey and keep you on track towards reaching your goals. Consider some of these apps when you are training for our upcoming Chaos Family 5k Walk/Run that is being held on Saturday, October 13th, 2018. Make it your next goal to participate in this exciting event that support our deployed military troops. routines? Be sure to comment with your experiences.